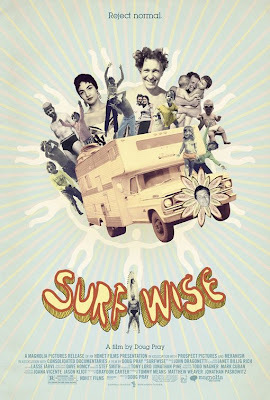 I watched this great documentary the other day (on my teeny laptop thanks to Netflix's cool "watch instantly" feature) called Surfwise. 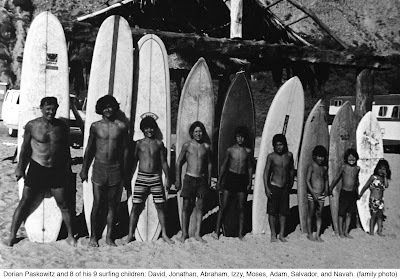 It's the story of Dorian "Doc" Paskowitz, his devoted wife, and his brood of nine surfing children who travel the country in a motor home catching waves and living in "simple harmony." These days, people who live off the beaten path can be found with increasing frequency, but Doc was a sort of trailblazer who gave up a successful and profitable medical career, his house and possessions, and the conventions of a "normal life" in favor of a pure existence in communion with nature and free of material possessions. I found this story so profound and thought-provoking. On the one hand, I was awed by Doc's ethos and thought his kids had to have been the coolest, most fearless and free badasses ever to roam the country. On the other hand, his insistence on bringing up nine children in a cramped trailer with none of the comforts of the modern age, moreover without a choice in the matter (the kids could not attend school even when they begged for it), made him seem like a megalomaniacal dictator. Ultimately though, this is a really compelling story about life, love, family and freedom and I guarantee that by the end, no matter how you end up feeling about Doc, you will want to tap into a little bit of what he's got.